Alex Champion was one of nine artists picked for a Spaces of Nature exhibit held from May 12 to July 3, 1999 at the Richmond Art Center, Richmond, California. The show was guest curated by Dr. Peter Selz of Berkeley. He, with volunteers, installed the Cavern design, 18 by 29 feet. Earth, kindly donated by a near UC Berkeley field station, was hauled to the center court yard and built over a two day period. The cavern design contains the simplest representation of the meander pattern, a design at least 20,000 years old. The show moved to the Armory Center for the Arts in Pasadena, California. Lacking an appropriate space for an earthwork, space was provided by the nearby Huntington Library, Art Collections, and Botantical Gardens. The square spinning meander cross design was chosen to relate to a nearby Tempietto on the South Lawn below the Art Gallery. The Garden crew removed strips of turf and placed them on large plastic sheets to either side of the site. 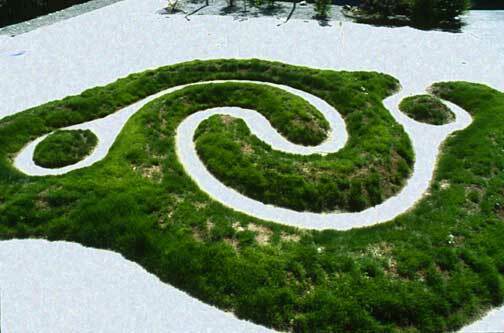 Champion, with volunteers, made the 60 foot design over a four day period, after which the strips of turf were added back to the mounds. The show ran from July 25 to September 12, 1999. 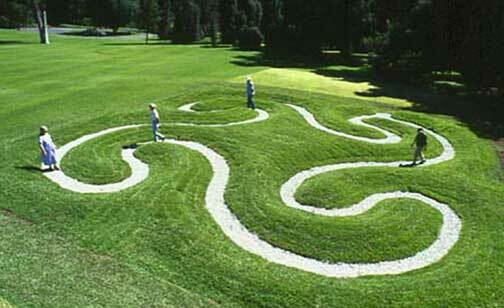 UPDATE AUGUST 2003: The installation at the Huntington Library, Art and Botanical Gardens has been extended indefinitely.